I found a new "old" Statue of Liberty for my collection. A small oval brass tray at the Rose Bowl Flea Market, $2. The amber bottle is from the Irvine Valley College Flea Market. It's changing venues, but still in Irvine on the first Sunday of the month... I also found the handled bowl which has an anchor engraved on it in Irvine as well, $5. Perfect for pocket change. What have you found lately? I love your finds and what great bargains. I found two incredible perfume bottles,one Murano glass in pink and the second is a fine red glass with gold rim, which came from Morocco sometime in the 40's. i love all your finds annie. another great thing about thrifting is the fact that your are keeping things out of landfills and not creating more packaging, etc. to fill them up. i'm helping a friend decorate her home and 90% of everything i've found has come from thriftshops and yardsales. just read your last post too. larry has been wearing clark desert boots forever! I love thrift stores and flea markets. Lately I've been trying to find interested vases and I've found so many! You live an inspiring life and I thank you for all of your wonderful, original posts. You have such a gift for styling vignettes. I have a very similar note on Ritz paper from my little boy. I use it as a bookmark, but I love how you framed yours. So sweet. love your finds, but my eyes went directly to your monogrammed goyard and the ADORABLE little love note! i saved that same stationary from our honeymoon at the ritz in grand cayman and have been dying to take harper there! hope you have a lovely upcoming weekend. can you even BELIEVE this weather?! it was 90 degrees here and i live half mile from the ocean! I love your finds they have character and add a luxe feel to your decor. You have a great eye for a bargain. I have heard great things about The Rose Bowl Market...we have nothing that comes close up here in BC. Your peach coloured rose is perfection. 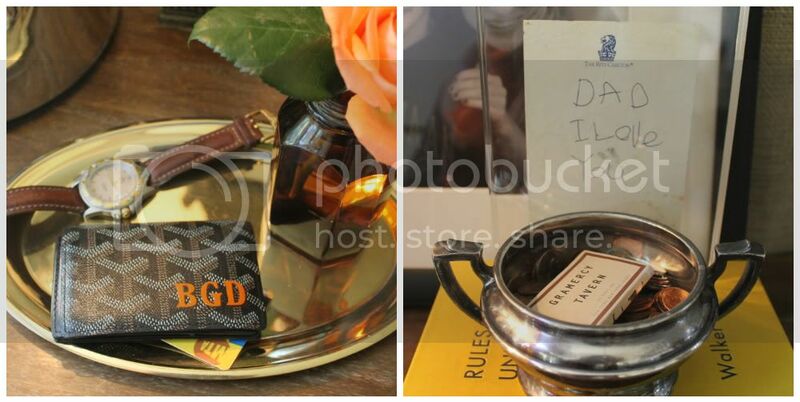 That tray and amber bottle are so lovely! here in singapore, we sadly dont have flea markets (miss that!) but I window shop on Etsy all the time and found some brass vintage birds I am dying over! I wish I had some amazing flea markets to go to in Seattle. I did make it to the Rose Bowl market when I was in LA years ago. You found some perfect pieces for your home, even better when they are priced well. All are great classics that you can enjoy for years! I love the hunt, even if I come home empty handed. I recently found three old brass hat hooks with the greatest shape. Someday when we create an enclosed portico,I hope to create a wall of them. Thanks for an always lovely post. Your vignettes are so simply elegant and just a little unexpected. I love this post, I've been amassing thrift store finds, lately. I've even found a few appropriate for holiday gifts! The Rose Bowl Flea Market used to overwhelm me, but I know it's where the best bargains are. I'm more of an off the beaten track hole in the wall type of thrift store person. I have been fortunate to find some great fashion finds lately, but not too much for the home. Although I did find the table setting for thanksgiving this year--those were some great finds.